What happened to the Scene? The New Year is a time for resolutions, renovations and reinventions— so welcome to Life. 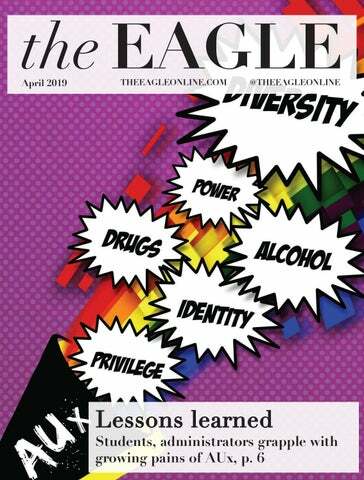 For as long as we can remember at The Eagle, The Scene section has been where arts and entertainment come together to add a little culture to our campus paper. But over time we felt we needed a change. The section needed someone to breathe life into it. So here we are, revealing the new Life section to replace The Scene. It may seem silly to replace a culture section with another culture section, but Life has been built following in the footsteps of the most respected news organizations in the country. What makes the lifestyle section of papers like The New York Times and The Washington Post thrive? We searched for the key to producing culture content that was well reported and well researched while also asking questions and inspiring students to explore our amazing city. The answer comes with ensuring the news peg in our stories. The Life section will produce content that provides cultural news and cover events to inspire exploration and learning. The biggest changes come within our section breakdown. Originally The Scene published under the sections Music, Lifestyle, Arts and Entertainment, and a Scene blog. Each of these sections have been improved and expanded, with the hope that AU students can rely on The Eagle to report on the culture of our city more efficiently. The Scene blog will now be The Silver Screen, posting content that is TV and film focused. We’ll review new movies before they are released, review TV shows and share thought provoking insight on topics revolving around this media. Food and Fitness will produce health and food news, inspiring students to eat great food and stay informed on wellness. Off Campus will publish a weekly “Life After Hours” to replace “The Weekend Scene,” which will inform students of local events and activities for the weekend. In addition, this section will cover festivals, markets and other events off campus. The final section, Arts and Entertainment, will look at all things music, theater, literature and visual arts. We’ve expanded our reporting style and content, and we hope this is something our readers will enjoy and our writers will benefit from. Please reach out with comments or questions, and we are always interested in having new writers!